I don’t usually venture into shopping malls for Cheap Eats reviews but I thought I’d make an exception this week for Duatti, a cafe inside Westfield Woden. Duatti has been around for almost a year now but it seems many people still don’t know about it. The friend I met up for lunch with had no idea what cafe I was referring to. When we arrived there was only one or two tables left and I was relieved to nab one. Duatti is just near Woolworths and a lot of people sitting down had groceries with them which made things a little squishy but not claustrophobic. The lunch menu at Duatti is quite good with a wide variety of gourmet sandwiches on offer, as well as a few types of hot dogs. Every single item on the menu bar one is less than $15 – so you’re pretty much guaranteed a cheap eat if you come here. I pondered the menu for a loooong time, I couldn’t decide what to order. 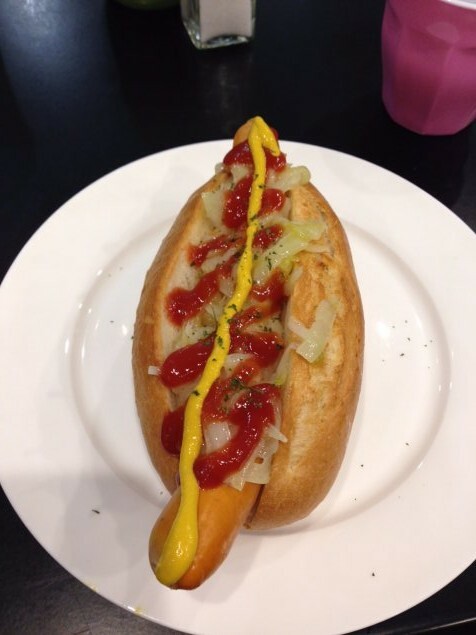 I wanted something a little different from what I’d normally have for lunch so I settled on a plain hot dog with a frankfurter, onions, mustard and tomato sauce for a very reasonable $6.90. 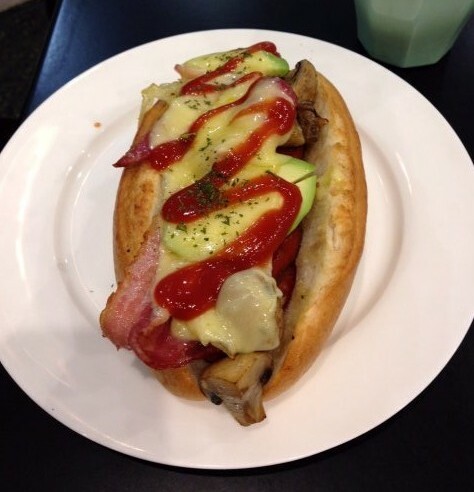 My friend ordered a big dog for $9.90 which came with onions, cheese, avocado, bacon, mushrooms, and she swapped the frankfurter for a kransky (extra $2). Our meals came out quite quickly and were presented on a simple white plate. They looked pretty good and were decent in size – we had to cut them in half to eat without spilling it everywhere. I have to say, I was slightly disappointed with the frankfurter. It was a little overcooked and didn’t really have any taste. The hot dog bun was amazing though – crunchy on the outside, soft on the inside – and the toppings were decent too. My friend really enjoyed hers – maybe the kransky would have been a better option for me. Even though my experience wasn’t 100% perfect, I would still definitely return to Duatti. I want to try one of their gourmet sandwiches next time! A few ex-Silo staff seem to be working here. Could be the reason for the nice rolls!